Andrew Rea from the popular YouTube series, Binging with Babish, helps us celebrate the adventures of summer with a collection of delicious recipes paired with Diamond Collection wines. 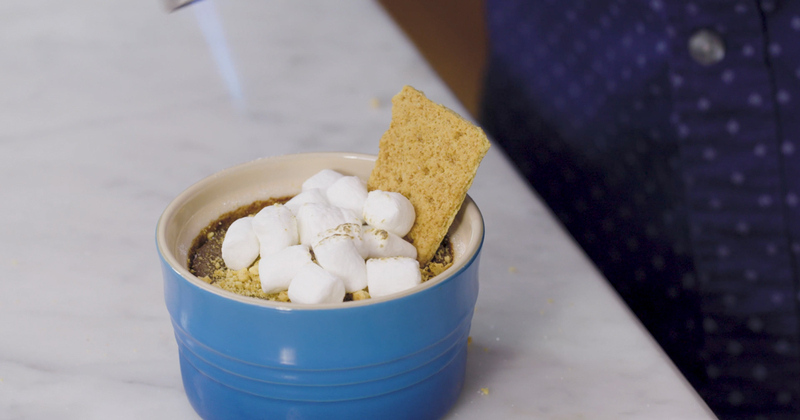 In this episode, Andrew prepares campfire-inspired Créme Brûlée you can make in your kitchen paired with Diamond Collection Merlot. Get the full recipe below. Preheat oven to 300 F degrees. Separate eggs and place the yolks in a bowl. Eggs separate best when cold. Add granulated sugar to the bowl of egg yolks. Whisk for 2-3 minutes or till sugar is completely dissolved and mixture turns pale yellow. Set aside. In a pan, put heavy cream on medium heat. Once the cream heats a bit, add chopped chocolate. Mix till chocolate is completely melted and mixed with the cream. Bring the mixture to a light boil and remove from heat. Add the cream to the egg yolk-sugar mixture, little at a time, stirring continuously. This is important as we don't want to cook the eggs. So add the cream little by little and keep whisking. Once all the cream is incorporated, add in the ground coffee (optional) and mix. Strain the mixture to another bowl so that we get rid of any lumps/particles (if any). Divide the mixture equally among 4 ramekins. Transfer the ramekins to a pan and then fill the pan with boiling water till ramekins are half submerged in water. Bake at 300 F degrees for 25-30 minutes or until the custard appears set but still jiggles a bit. The deeper ramekins may take more time to set, these took 25 minutes. Carefully remove the ramekins from the pan and let them cool completely. Once cooled, wrap and chill overnight or for a minimum for 4 hours. Once the custard is chilled, take the ramekins out of the refrigerator and let it sit at room temperature for around 20-30 minutes. Sprinkle around 1.5-2 tablespoons of sugar on each dish, making sure it's properly covered with sugar. Using your kitchen torch, caramelize the sugar, it will turn hard and crispy. You can also do this step of melting the sugar in the oven, on broil. Let the ramekins sit for 5 minutes and then top with graham cracker crumbs (as much as you like!). Top with toasted marshmallows (broil or use torch), drizzle melted chocolate on top and serve immediately with a stick of graham cracker.